Our beloved Mr. Paul Hewson, aka Bono, turns 50 today. Regardless of how most people felt about their last album, No Line On The Horizon, (me excluded, I enjoyed it) you can’t deny that the man can still wail. For all the activism and political moving and shaking he’s involved in, he can still hold an arena full of people in the palm of his hand, deliver an outstanding rock show, and somehow pull off the “shades all the time” look. So in honor of Bono’s birthday, I’m going to feature one of my favorite U2 songs, “Bad”. “Bad” is from U2’s 4th album, The Unforgettable Fire, released in 1984. After touring the world behind their previous album, War, which was full of harsh guitar tones and militaristic drumbeats, U2 decided to change directions for The Unforgettable Fire. 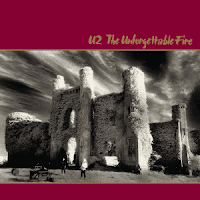 If War was a bombastic call to arms, The Unforgettable Fire was a hushed meditation. The musical foundation laid by Larry Mullen’s drums and Adam Clayton’s bass became more fluid and subtle and The Edge started really experimenting with delay, echo, and reverb effects. Ambient keyboards and looser arrangements provided more of an “atmospheric” feel for Bono’s new ambiguous lyrical direction. All of these new sonic ingredients are married together perfectly in “Bad”. Written about a friend’s struggle with heroin abuse, “Bad” starts with a beautiful guitar riff, builds into an explosive crescendo of instruments and voice and then ends as calmly as it started. Whether it’s due to the personal subject matter or just the confidence brought along with experience, Bono gives one of the most emotional vocal deliveries of his recording career. Seriously, it’s that strong. If the hairs on the back of your neck aren’t standing up by the time he starts belting out “I’m wide awake,” you may want to ask the wizard for a heart, Tinman. Although “Bad” never made a huge splash on radio when it was released as a single, it remains one of U2’s best-loved songs. They continue to play it to this day, almost always going into an extended jam while Bono sings lyrics from some of his favorite songs. Some of the more popular examples of this can be seen during their 1985 Live Aid performance (“Satellite of Love” by Lou Reed, “Ruby Tuesday” by The Rolling Stones, “Sympathy for the Devil” by The Rolling Stones, and “Walk On The Wild Side” by Lou Reed) and on the film version of Rattle and Hum (“Ruby Tuesday” and “Sympathy for the Devil” again). In fact, their Live Aid performance of “Bad” went on for so long that they only got to play 2 songs instead of 3. Although the other band members weren’t very happy about this, it easily became one of the most memorable performances associated with Live Aid.